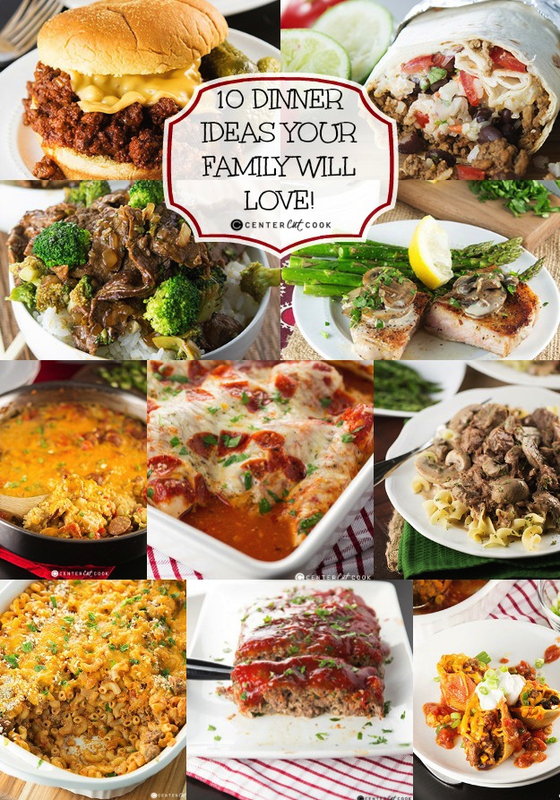 10 Dinner Ideas Your Family Will Love including dinner ideas for two, options kids will love and recipes made with ground beef and chicken! There’s something for everyone! One of the questions I get asked most often is what are you favorite dinner ideas? For me, it’s super hard to narrow it down because there are SO many great options. Today I thought I’d share 10 of the dinner recipes we’ve been enjoying lately. There is something for everyone including ideas if you’re cooking for two, recipes that the kids will love, and a variety of protein choices including ground beef, chicken, and pork chops! My hope is that you’ll find a few ideas to try to make your weekly menu planning just a bit easier. Mexican Stuffed Shells – Traditional Stuffed Shells meets the taco and the result is Mexican Stuffed Shells filled with everything you love about tacos! They are creamy with cream cheese and cheddar cheese, and they can be made with chicken or ground beef. Mexican Stuffed Shells are hearty, comforting, delicious, and a family favorite! Broccoli Beef Stir Fry – Broccoli and Beef served over rice is a classic stir-fry recipe that will satisfy your craving for Chinese food! There’s no need for Panda Express when you can enjoy this Broccoli and Beef right at home. Cheesy Pizza Chicken – If you love pizza, you are going to love this recipe for Cheesy Pizza Chicken with gooey cheese, pizza sauce, and all of your favorite pizza toppings baked to perfection! Cheesy Macaroni and Beef Casserole – Cheesy Macaroni and Beef Casserole with ground beef, crushed tomatoes, lots of sharp cheddar cheese and topped with crunchy bread crumbs! It’s the perfect quick weeknight meal that everyone including the kids will enjoy! Easy Meatloaf – This easy recipe for flavorful meatloaf is made with ground beef and topped off with a super simple sauce. The leftovers are perfect for making a sandwich! Meatloaf is a classic, and this recipe is delicious. Slow Cooker Sloppy Joes – Slow Cooker Sloppy Joes are made right in the crock pot with ground beef, ketchup, a little brown sugar, worcestershire sauce, and a few other ingredients that you already have on hand. It is easy, saucy, and can be made with turkey as well for a healthy alternative to the ground beef. Beef and Bean Burritos – Seasoned beef and beans get stuffed into tortillas alongside cilantro lime rice, monterrey jack cheese, pico de gallo and sour cream to create the ultimate flavor-packed burrito made right at home! These burritos are ready in under 30 minutes, making them an easy weeknight dinner. Cheesy Chicken and Rice Casserole – This Cheesy Chicken and Rice casserole recipe starts in a skillet and finishes baking in the oven. The result is a casserole that is a perfect dinner recipe that everyone will enjoy. It’s cheesy, comforting, and so delicious! Pan Seared Pork Chops with Mushroom Sauce – These Perfect Pan Seared Pork Chops are made right on the stovetop and ready in minutes! Best of all, they are tender and juicy with just a hint of pink in the center. The mushroom cream sauce that goes on top compliments the perfectly cooked pork chop beautifully! Slow Cooker Beef Stroganoff – Slow Cooker Beef Stroganoff – a healthy version that is made with NO cream soup! You can make it with or without mushrooms. This is a recipe the whole family will love and it comes together quick!